Today is the first of September. Many Public and Private schools are back in session, and from all I see on message boards and across Social Media sites, many Homeschoolers are back to the books as well. I just wanted to remind you of an amazing resource out there for homeschool families. This month’s subject is Struggling Readers, please be sure to stop by and check out all the great information other homeschoolers have gathered to help you in this area. The menu this month is completely FULL of Crock pot recipes to help ease your load with easy to prepare, family friendly meals. All this is free to those who already subscribe to The Old Schoolhouse Magazine. Click on the Toolbox above to get your subscription today! I have been telling you since I started this blog that you NEEDED a subscription to The Old Schoolhouse Magazine. It is so full of encouragement and information, I really think every homeschooler could benefit from it regardless of the method you use to school. • Access to EVERY digital issue ever created! • Access to a special password-protected section of the TOS website available only to subscribers, containing article after article of inspiration and support. • Monthly calendars featuring “This Day in History” activities and lessons for each day. • Frugal tips with Molly! • Guest “speakers” popping up to inspire us. Think of it as a homeschool seminar at your fingertips! • Free E-Books, crafts, printable content, unit studies, and so much more! I know that times are tight for folks around the country but I want you to know that there is always a sale going on for a subscription to this magazine, and there is bound to be a price that fits your budget. Prayerfully consider a subscription with your spouse. The encouragement is so worth the price. My husband reads the magazine too. In the last issue, he found an article that said, when homeschool moms neglect their personal time with the Lord, and do not create a time in the day to be still and recharge their batteries…they tend to feel overwhelmed and exhausted. He brought me the magazine…. asked me to read the article… and then said, “What can I do to help you have that kind of time in a day?” This is just one example of how this magazine has been such a blessing to us! The Old Schoolhouse Magazine has always been more than words on a page. In addition to the magazine it is an online community on Facebook and Twitter where you can go to ask questions and get answers from other homeschoolers. It is a place to share ideas and encouragement. The Teachers Toolbox enhances that community with providing you instant access to tools that will help you teach your child. 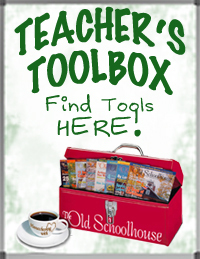 I am blessed to have been chosen as a Star Contributor for the Teachers Toolbox. Star Contributors are crazy busy homeschool parents like you, that are eager to share and encourage you on your homeschool journey. Many of us have been where you are…. searching the Internet for information…. going cross-eyed looking for things and then forgetting where you wrote them down… The Teachers Toolbox is where we put all the things we have made, and found… all for you…. and it is FREE with your subscription to The Old Schoolhouse Magazine. If you don’t have one already…. go and grab your subscription TODAY! I’ll look for you in the Teacher’s Toolbox, where inspiration builds education.